I made no modifications to the pattern. I chose to knit in garter stitch and I made the yo instead of the m1. I'm glad I did because the baby revealed herself to be a girl and I think yo's are girl-like. I used some cute cotton ribbon I found at Micheal's for the closure. I just sewed the ribbon on with needle and thread. 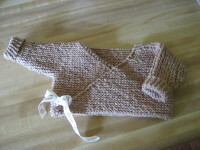 This sweater is for Taylor Isabelle, the first grandchild of a friend of ours. 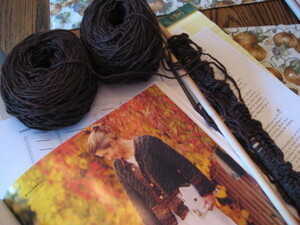 The yarn is not uniform in diameter and has a homespun look. It is very soft and easy to knit with. 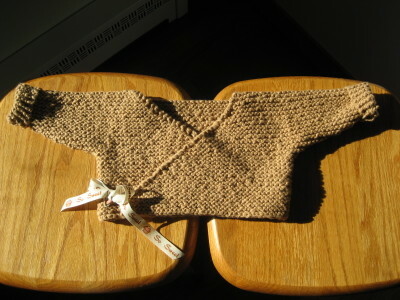 This was my first project knitting in Continental style and I find I like it. I'm still not as fast as I would like but that will just come down to knitting more. I hope. 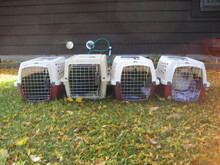 The four kitties were transported to the vet for their annual check-ups and shots, first thing this morning. Blue's on the right and Fuzzle, White Dot and Black Dot also in their transport boxes but black cats are very difficult to photograph. Take my word, they're there. There was a symphony of protest all the way into town to the vet's office. DH thought they sounded like frogs in a pond just after sunset....MEOW, meeeeooowwww, Meow, MEeow, meOWWWW, and so on. I'm glad it was only five miles. Everybody passed Dr. Ron's inspections. We had scheduled this event for last week Saturday, but my DSIL's mother passed away so we attended the wake last Saturday. Rachel was too young at age 67 to be lost to cancer. She leaves her husband, two daughters, two son-in-laws, and four grandchildren. After a haircut and some laundry, I made my way to the garden. It has been a good week since I've been able to get out there. It shows. Here's my micro greens....well, *ahem* er, rather, my MACRO greens. 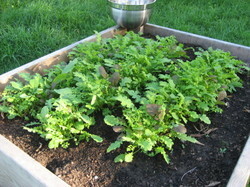 But, they will still be fine for a salad tomorrow night with grilled pork chops. I harvested my Kolasco Paprika peppers that were ripe. 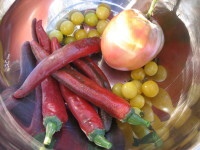 I'll dry these and grind them for a yummy paprika for cooking. I'm going to try to save the seeds since I can no longer find this variety. The original seeds came from Shepherd's Seeds but Renee Shepherd sold the company and the new company hasn't carried them since. I'm hoping the seeds will work next year but I'll be on the look out for more. (hint, hint) I also pulled a few carrots to sample this evening. Yes, you are seeing purple carrots. I think they are "Purple Haze" but I'm not sure because I didn't make good garden notes this spring. Fresh carrots are very flavorful and beat out "store-bought" bagged carrots for flavor every day. 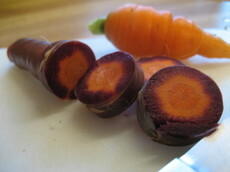 The purple carrots look different but taste the same as an orange carrot. 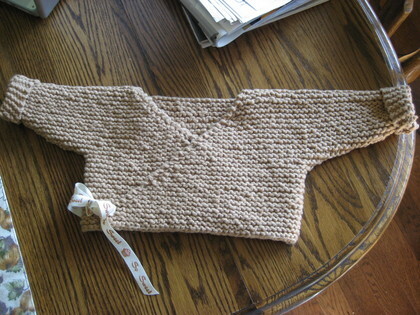 And for knitting progress, here's the Baby Kimono as of the typing of this post. I intend to finish and block this tomorrow. I hope everything else cooperates so it happens. I'm going to save the bread baking photos for tomorrow. However, I can tell you, the bread smells delicious as it is cooling. When I find my camera, I'll show you the great knitting books Mom found today at the Oshkosh Public Library sale. All for fifty cents a piece---what a bargain. No, there aren't any Alice Starmore titles, either. Too Bad. I'm going to take them home and read them for a while. Mom wants one back for a potential knitting project this winter. Autumn is certainly tapping Summer on the shoulder in an attempt to cut in on our last dance. After the beautiful weekend, also with typical signals of fall....cooler temperatures, open windows, the sound of an occasional chainsaw and the Packer football game on television...Monday was much cooler and rainy. Really, it was an excellent example of *MONDAY* as in I don't want to get out of bed because it is still dark and my bed is so cozy and, well, I'm sure you know the feeling. As I was driving north, I watched the temperature drop degree by degree on the digital display in my Jeep. Fifty-three degrees Farenheit at 9:00 AM. Hmmm, did I forget to pack anything? Shoes, check.....pantyhose, check....nighties, check.....jacket.....jacket.....JACKET? No jacket. How quickly I forget the rapid change of seasons in Wisconsin. This is the time of year when Summer and Autumn flirt with us. We enjoy our old love, Summer, when it comes back but then disappears for days or weeks. Our new love, Autumn, caresses us with cooler breezes but warms us with a now more gentle Sun. I enjoy the change of seasons that I'm subject to living in Wisconsin. I love the way my thoughts turn from knitting socks to knitting a thick, cozy cardigan. And tomato use turns from BLTs to marinara sauce or vegetable soup. 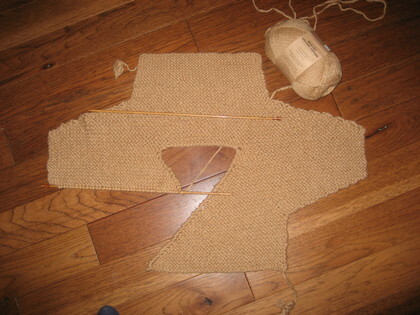 Knitting-wise, I ripped out the start of the baby kimono that I started in stockinette and started again, also Continental-style, with garter stitch. I'm much happier with the result. I am still not too far along but I'm working on it at lunch time and I should knit for an hour this evening, if I can drag myself away from the computer. I'm on dial-up and, goodness, blog-page loading is S-L-O-W. So if my frustration with the slowness wins out over my curiousity to read blogs, more knitting will be accomplished. I'm pushing the envelope a bit on this project. I'm knitting it Continental-style. No big deal for those of you who naturally knit this way, but I learned to knit by "throwing" my yarn, so this exercise is trying to educate my left hand to hold the yarn with the correct tension as well as try to form the stitches correctly. 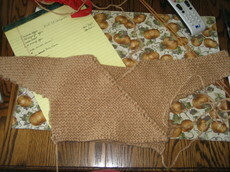 So far, so good.....besides an aching left pinky finger after two inches of stockinette stitch. (Yes, I can hear it now...."wimp!") This method does seem to go faster, which is my goal. 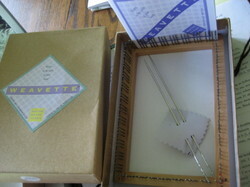 I do want to knit faster and I think learning to knit by "picking" the yarn will get me closer to my goal.